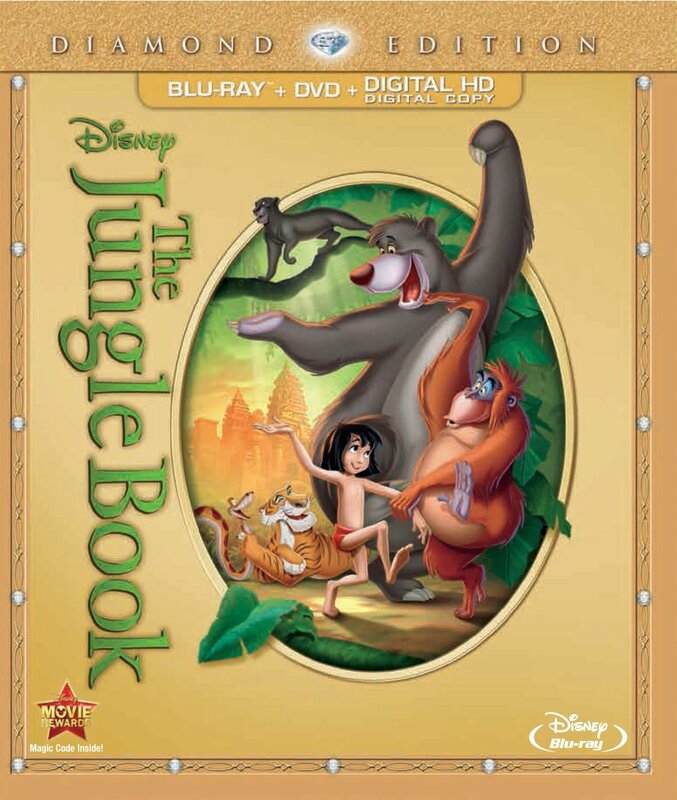 About 6-7 years ago I reviewed the Jungle Book - 2-Disc Platinum Edition, and though it wasn't my favorite Disney movie but it was enjoyable enough. Well, now Disney has released a Diamond Edition consisting of a blu-ray, DVD, and digital copy, and while the movie itself hasn't changed I do have to say that this HD blu-ray release sure does look fantastic. They really cleaned it up so there little to no grain and nice solid colors that pop. They also gave it a 7.1 audio soundtrack, but I only have a 5.1 setup so I wasn't able to experience all that audio glory. The original theatrical mono track is included as well for purists. Since I've already reviewed the platinum edition of the movie, I won't go through the plot and characters and all that again. Just read my previous review since nothing has changed in those regards. It's not like the Star Wars special editions with a bunch of new CGI scenes added in. There are several new extra features included with this release such as a recently discovered alternate ending, new interviews, and a look at a Disney theme park in Florida. The alternate ending was never animated or even storyboarded, just written, but new storyboards were created in order to present it to us along with some added narration. I'm glad they did that, as it would have been pretty boring to just read it. The Music, Memories & Mowgli featurette contains new interviews with Diane Disney Miller, songwriter Richard Sherman, and animator Floyd Norman, which are interesting. The I Wanna Be Like You featurette is all about Disney's Animal Kingdom theme park, and is like twice as long as the Music, Memories & Mowgli featurette, which is a bit unnecessary. I would have like to see more of the interviews than about the theme park. There is really a lot of extras here. Some are better than others, but in total the extra features here clock in at way over the runtime of the actual movie so you really feel like you're getting your money's worth. If you don't yet have this movie and want to get it, this is defintely the release to pick up.